The 1980 United States Grand Prix West was the fourth round of the 1980 Formula One Season. The race was won by Nelson Piquet in a Brabham ahead of the Arrows of Riccardo Patrese and Emerson Fittipaldi in his brother's car. The race was marred by a serious accident which saw Ensign driver, Clay Regazzoni crash out on lap 50, suffering severe injuries to his spine. The accident not only ended the career of Regazzoni but left him paralysed from the waist down for the rest of his life. After his back to back wins in Brazil and South Africa, René Arnoux had taken the lead of the driver's championship ahead of Williams driver Alan Jones. As well as this Renault now led the constructor's championship ahead of the Williams team. McLaren driver Alain Prost was still out of action with a broken wrist following his qualifying accident in South Africa. The team had hoped to run former driver and world champion, James Hunt who had recently retired from racing the previous year, however Hunt himself was injured with a broken leg following a skiing accident. The team instead hired, Formula Two racer Stephen South for the grand prix. Similarily at ATS, Jan Lammers returned as a full time driver with regular driver Marc Surer out of action after breaking his legs in qualifying for the previous event. As the race began, Nelson Piquet maintained his lead heading into the first corner. At the back, John Watson's McLaren failed to get away and had to be push-started by his mechanics. There was carnage heading into the first corner, Ricardo Zunino, Mario Andretti, Jochen Mass and Jean-Pierre Jarier all made contact. Zunino was out on the spot, whilst Andretti limped back to the pits to retire from the race. Patrick Depailler moved into second position ahead of René Arnoux, Alan Jones, Bruno Giacomelli, Riccardo Patrese, Carlos Reutemann, Gilles Villeneuve and Derek Daly. Jan Lammers who had a magnificent qualifying to start from fourth, had retired on the first lap with transmission problems. On lap two, Reutemann managed to overtake Patrese for sixth position. The following lap however, Giacomelli spun at the hairpin, leaving Reutemann nowhere to go, piling into the back of him. The two cars blocked the circuit, causing much of the mid-field to be caught up in the accident. Elio de Angelis and Jarier were caught up in the crash, retiring from the race alongside Reutemann. Jody Scheckter and Eddie Cheever were also involved in the accident but were able to continue. Giacomelli who had started the pile-up managed to continue the race with the assistance of a push-start from the marshalls. Meanwhile up front, Piquet was dominating the race. His lead over Depailler in second position extended lap after lap, Depailler unable to compete as he began to battle brake troubles. He then fell into the clutches of Alan Jones who had moved up to third following an overtake on Arnoux. Arnoux was dropping back and would soon fall behind Patrese as well. After a long battle, Jones was able to overtake Depailler on lap 18. Depailler would then retire on lap 46 with suspension troubles. Towards the rear of the field, the second Alfa Romeo of Bruno Giacomelli was making a comeback. Giacomelli held an extensive battle with Clay Regazzoni, Emerson Fittipaldi and John Watson at the rear before managing to clear the trio and begin carving his way through the mid-field. Lap 46 saw Gilles Villeneuve retire from the race, the Ferrari driver pulling into the pits with transmission troubles. Villeneuve retiring, following an incident which saw him clip the back of Daly's Tyrrell whilst lapping him. 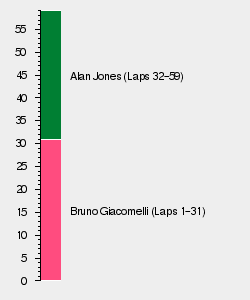 On lap 47, Jones who was moving through the backmarkers went to overtake the surging Bruno Giacomelli. The Alfa Romeo driver, however closed the door and the two driver's collided. Giacomelli's move had ruined both driver's race and they were out on the spot. Piquet continued to dominate, now leading Arnoux, Patrese and the battling trio of Regazzoni, Fittipaldi and Watson. The three cars who had been battling throughout the race provided an exciting spectacle for the spectators, however the race was about to take a dramatic turn for the worse. On lap 50, Regazzoni who was running well in fourth place failed to brake heading into the Queen's Hairpin. The Ensign driver suffering a brake failure slammed into the barriers at full speed. Regazzoni smashed through Zunino's parked Brabham, several tyre barriers before colliding with a concrete wall. It immediately became apparent that Regazzoni was severely injured. Medical teams were quickly on the scene to extract Regazzoni from his stricken Ensign. Whilst Regazzoni remarkably survived the incident, he suffered severe spinal injuries that would render him a paraplegic, bringing an end to his ten year Formula One career. Arnoux dropped out of second following a puncture, leaving Patrese to inherit second position. This meant the now battling duo of Fittipaldi and Watson were now fighting for the final podium position. Watson was able to briefly overtake Fittipaldi, however the McLaren driver began to suffer brake troubles and lost third to Fittipaldi once again. Watson began to drop back into the clutches of Jody Scheckter's Ferrari. Scheckter attempted an overtake, however botched his manoeuvere, forcing him to drop back and concede fourth place to Watson. Piquet went on to take a dominant race win, 49 seconds ahead of Patrese's Arrows. Fittipaldi was in a remarkable third place, having barely qualified into the final grid place ahead of Watson, Scheckter and Didier Pironi.